A little known but very successful treatment for the elimination of chronic or short-term pain in bones and joints has been available for several decades. Published medical studies attest to its effectiveness. No longer is it necessary for patients to suffer for months or years taking pain medication daily, until the joint is destroyed and the patients’ lives are totally impaired. It is no longer necessary to resort finally, to surgery or artificial joint replacement. Reconstructive therapy (also know as sclerotherapy and proliferative therapy) is a method of injecting an irritant and anesthetic into arthritic joints or into weakened, torn or pulled ligaments and tendons. This causes healing cells (fibroblasts) to travel to the weakened area and strengthen it. This has been proven in scientific studies including those done by George Hackett, M. D. in 1956; the University of Iowa in 1983 and 1985; and in a double-blind human study by the Sansun Research Foundation in 1987. There are also continuing studies in progress now. Dr. William Kubitshek, past president of the American Osteopathic Academy of Sclerotherapy states that over 600,000 people have been treated with this therapy. How is New Tissue Made? Biology has very few laws, but one law is the Arndt- Schultz Law. It states that small stimuli are stimulating.Large stimuli tends to inhibit. For example, a little electrical current stimulates circulation and healing. A large electrical stimulations caused decreased circulation and cell death. Mild irritating reconstructive solutions cause dilation of blood , vessels and a migration of fibroblasts (healing cells) to the injured areas. The fibroblasts then lay down collagen which is structural protein to repair the areas. The University of Iowa and Dr. Hackett’s research substantiate this regrowth. How Long Has Prolotherapy been in Use? In Use Over 60 Years The Therapy was discovered inthe United States in the 1920’s by George S. Hackett,M. D. of Canton, Ohio and by two osteopathic physicians, Gedney and Shumann, in Philadelphia. The therapy never became widespread because the solution used is not a patented substance so there was no financial incentive for a pharmaceutical company to promote its use. A physician must be specially trained in the use of sodium morrhuate and the techniques.The patient must also have good biochemistry status to heal areas which have poor blood supply. Many people think that if they have no symptoms that they can heal their tendons, joints and ligaments. This is not true as biochemical problems can exist for many years before a symptom or tumor results. The doctors recommended a customized detoxification program using natural methods to remove waste products left by drugs, pollutants, food additives and poor diet. Appropriate supplementation, bowel and dietary changes are also often recommended. Tendons and ligaments do not gain strength with exercise as many think. This is because there are no muscle fibers in a tendon or ligament. The non-surgical joint, tendon and ligament therapy is indicated for joint, tendon and ligament problems which exercise and all other methods fail to help. Although Medical Society guidelines do not permit public display of fees, the cost for this therapy is usually only a fraction of what a surgery costs and it also compares favorably with the cost of chair lifts, wheelchair braces, drugs and other aids which only help a patient live with the problem. The goal of the therapy is to permanently eliminate the patient’s need for these devices and to regain independence. In acute injuries the ligaments and tendons become torn. (See Illustration #7). Ligaments function to limit the range of motion that bones can move between each other. Ligaments function to stabilize joints and hold the joint together (See Illustration #8). Tendons function to attach a muscle to bone in order to provide motion. Discs and cartilage serve to absorb shock and keep the bones from rubbing against one another. If the ligaments become torn or overstretched, the joint becomes unstable and resultant friction causes the discs or cartilage to become worn down causing a loss of height. 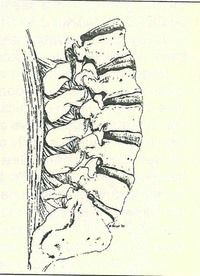 The disc and cartilage may also become worn down by repeated motion. (See Illustration #9).This loss of height causes further ligament laxity and this more instability. The friction of the joint is a stress. BONES RESPOND TO STRESS BY MAKING MORE BONE. 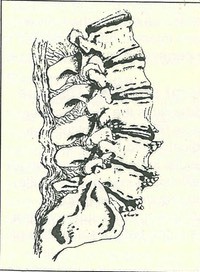 This results in bone spurring (See Illustration #9) which is the body’s attempt to splint or stabilize the unstable joint. Degenerative disease is merely the body’s attempt to stabilize joints as the tendons and ligaments have not been able to heal because of lack of blood supply. If a patient has considerable degenerative arthritis, the loss of disc or cartilage height causes a laxity of the supporting ligaments. This causes joint instability. (See Illustration #9). Reconstruction has been shown to be effective in these conditions causing the lax ligaments to become strengthened, thus stabilizing the joint and allowing for increased function and endurance (SeeIllustration #10). Some therapists add a very very small dose of cortisone to help limit discomfort. Reconstruction therapy (also known as sclerotherapy and proliferative) is given by a slender needle, similar to the hair like needles of the acupuncturist, into the fibro-osseous junction (See Illustration #10). This is the area where the tendon or ligament attaches to the bone. The substance contains sodium morrhuate which comes from cod liver fish oil, and a local anesthetic. Repeated studies at the University of Iowa have shown that the areas injected have increased in size by 35%-40%, thus causing permanent strengthening. (See Illustrations #11 & 12). What Are the Effects of Degenerative Joint and Disc Disease? Degenerative joint and disc disease is the most frequent health problem listed by Americans 60 years or older in a study of 100,000 people by Medical World News. Degenerative joint disease results in pain, lack of strength and endurance causing those afflicted to lose quality of life, independence and possibly even require nursing home placement. Medications, physical therapy and surgery often fail to make any significant gains in the patient’s activities of daily living. 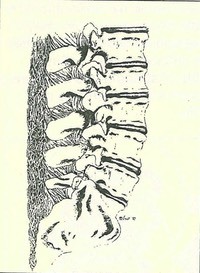 Basically when vertebrae and discs become degenerated they lose height. This height loss causes a laxity of ligaments. Ligaments function as the primary stabilizers of the joints and they connect bones to bones. Tendons provide support to a much less degree. Tendons primarily function to connect muscles to bones to provide purposeful movement. 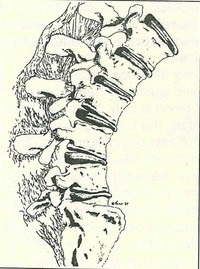 When the vertebrae and disc lose height this produces an effective laxity of the ligaments (See Illustration). Since ligaments are the primary stabilizers of the joints and they are lax when height is lost, instability, lack of endurance, aching and pain result. The bones and disc literally shake around causing friction. The friction causes a further wearing down of discs, cartilage and later even bone surfaces themselves. Wolf’s law states that bones respond to stress by making more bone. Therefore, arthritis spurring (spondylosis deformans) results as an attempt by the bone to stabilize the joint. Rudolph Steiner, Hans Heinrich, Reckwig Hahnemann and many others recognize that inflammation is the body’s healing response. Inflammation has been studied in detail. It consists of a cascade of multiple biochemical events. These events are summarized as follows. (See Illustration below). In an injury or inflammation, blood or bleeding occurs inthe traumatized area. White blood cells (neutrophils,monocytes, macrophages) and platelets travel to thearea. The injury releases irritants (kinins, cell membrane phospholipids) and other substances which cause activation of the white blood cells. They clear up the area by phagocytizing (eating) bacteria and other debris. In the process, the white blood cells and platelets release growth factors which cause three events of major importance. First, the growth factors cause new blood vessels to organize and form in the area. Second, the growth factors cause mitosis or cell division. Third, fibroblasts or healing cells become activated and lay down collagen or connective tissue. This rebuilds the traumatized inflamed area. Reconstructive therapy involves the injection of biological irritants (in our case Calcium Gluconate or 50% dextrose) placed with a very fine slender needle atthe precise areas which need to be tightened., stabilized and rebuilt. This starts the repair cascade as described. The injection solution is combined with a local anesthetic to provide some immediate relief. What Patient Sign and Symptoms May be Helped? Manipulation frequently makes big improvements quickly. If prolonged Manipulation is necessary this is an indication of joint instability and injectiion reconstructive therapy may be helpful. Any musculoskeletal problem which has failed with surgery and other methods. Any condition which is helped by a brace, splint, crutch, walker, lift or wheelchair. People that need these aids frequently have weakened or lax joints. Various conditions such as osteoporosis with compression fractures, muscular dystrophy, multiple sclerosis and spinal defects such as scoliosis and spondylolisthesis (slipped spine). Any joint which swells chronically may be a candidate for resolution with this therapy. Swelling may be an indication ofchronic friction from instability. Any joint, tendon, ligament, cartilage, for which cortisone, Indocin, Naflon, Clinoril, Feldene, Motrin or other anti inflammatory drugs has been used may respond to reconstructive joint injection therapy. Conditions like carpal tunnel syndrome, rotator cuff tears and temporal mandibular joint dysfunction may also respond to joint reconstruction injection therapy ecause joint, ligament, tendon, disc and cartilage weakening are involved. What Are the Symptoms of someone Who May Benefit from Prolotherapy? 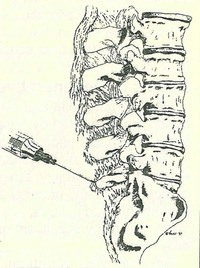 Anytime anyone injects you with 50-100 small injections you will feel something. There is a solution to help ease the pain. Prior to the treatments (1-2 hrs) we have the patient put a topical Novacaine Cream on the area that will be injected. We have this cream available at the clinic. We then cover the cream with Saran Wrap or Press and seal to keep the caine cream in contact with the skin. It numbs the surface and the pain from injection is reduced anout 80%. Before you put the cream on, the nurse instructs the patient as to quantity. How Long Does It Take to Reconstruct a Joint? This varies upon a number of factors. Severity of the problems, amount of use and weight bearing, intestinal absorption and elimination, diet, mental attitude and overall health status are some of the elements which control the rate of reconstruction. In very general terms which may not apply to an individual case, it takes from several months to a year or longer, working 2 to 4 times a month to obtain maximum regrowth of tendons, ligaments and joints. Long distance patients can also obtain success by working intensively, obtaining treatment when they can. Patients are advised that the treatment should be viewed as similar to building a home. Once the results are obtained, they are assets that are permanent. For quickest results, weekly treatments are done. Patients may work slower if they wish. Some long distance patients elect to work intensively for 1 day – 2 days or even a week or longer before returning home. They return as they can until they receive maximum benefits. What are the Results of the Therapy? Successful therapy results in a permanent strengthening of the treated area. As a result thepatient is usually able to return to activities which formerly they were unable to do. Each treatment session results in more and more tissue being laid down in the needed areas. As a result the joints continue to become stronger. The patient notes more endurance in that they can do more activities as well as activities they couldn’t do before.The main side effect of the treatment is less pain as the result of the joint being stabilized. Also, snapping, clicking and popping sounds go away. The patients can usually feel the joint becoming stronger with each treatment they receive. Results Are Permanent. Once a patient receives enough therapy to reconstruct the joint, tendon and/or ligament, the results are permanent. We have had patients who were involved in major auto accidents within 1 – 3 years after their joints had been reconstructed and the treated joints were found to remain strong even after their accidents. A positive outlook and persistence are necessary. One must belike a farmer growing a crop. He must work at it doing what is needed with enough repetition to regrow the tissues. To be complete this may take a growing season or two. Once you’ve gotten your result there isno going backwards. You make headway and keep going from there. The Clinic doctors are very excited about the therapy and have had it themselves and have provided it to hundreds of patients. The therapy has been written up favorably in The Lancet, a well respected medical journal. All joints can be treated. The treatment has alsobeen successful in cases of migraine headaches,carpal tunnel syndrome, back pain of almost all types, disc herniation, failed surgery, sciatica, arthritis, backfractures, unstable joints which slip out, heel spurs, tennis elbows, rotator cuff tears, knee and hip problems and temporal mandibular joint dysfunction (TMJ), ankle dysfunctions, and other problems. Are There Any Double Blind Studies Showing the Efficacy of the Treatment? Double-Blind Human Study Demonstrates Reconstruction Success. 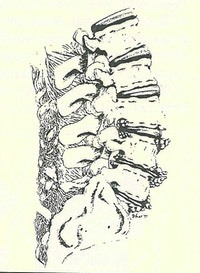 In a study at the Sansun Medical Clinic of Santa Barbara, California led by Robert Klein, M. D., a rheumatologist and Thomas Dorman, M. D., an internist, they conducted the most difficult task of a double blind human study in the most difficult cases of continuous low back pain patients who have suffered for ten years or longer. They divided 81 patients who have had surgery, medications, manipulations/adjustments, exercise, physical therapy and other treatments which failed to provide adequate relief for 10 or more years. One group was given manipulation and a reconstructive solution of dextrose, glycerine and phenol. The other group was given the same manipulations and normal saline injections. Great care was taken to insure that neither the patient nor the physicians knew which solution was injected. Both groups were given a total of six sessions of treatment. The results were tabulated and then the code was broken. It was found that 88% of the group injected with the reconstructive solution had moderate to marked improvement. They reported their findings in the prestigious British medical journal, The Lancet on July 18, 1987. What Should Be Done Along with Prolotherapy to make it More Effective? There are three basic components to rebuilding a joint. The Prolotherapy is the mainstay as it stabilizes the joint to essentially keep it from erasing itself. But the joint may have thinned and needs nutrients to help rebuild itself. The main nutrient is Glucosamine. If you would take a piece of cartilage and boil it in acid until your reach the smallest molecule it contains, that molecule would be Glucosamine. Hence, by supplementing with Glucosamine, you give the body the main nutrient it needs to heal itself. Then we take the guidance from the Trace Mineral Analysis (Click herefor more information about Trace Mineral Analysis) and supplement the patient with whatever minerals they are deficient in and put them on Vitamins that help build collagen. In the older patient where there are a lot of arthritic spurs, EDTA chelation may be helpful but most patients do not usually need it. Have the Doctors Published any Scientific Papers on Prolotherapy? Yes, They have. The Doctors have authored over 32 scientific papersin their professional careers including papers on Nutrition, hair Mineral Testing, Chelation Therapy, and Prolotherapy. Their prolotherapy paper titled Magnetic Resonance Imaging of a Reduction in Disc Herniation using a combination of EDTA Chelation Therapy and Joint Reconstructive Therapy aka Prolotherapy. It was published in the Journal of Advancement in Medicine, Volume 5, Number 4, Winter, 1992. Are there any Case Histories You Can Provide? Yes but they are too long to list here. If you are interested in case histories, please go back our book entitled Joint Reconstruction Therapy. The final third of that book is devoted to case histories on how Prolotherapy has helped Backs, Knees, Shoulders and other joints..